Prapun is a store in South Extension. Firstly, they are wholesalers in handloom sarees and fabrics. The sarees & fabrics are sourced from Bhagalpur in Bihar. Their original shop was in the South Extension Shopping Market. They have recently relocated their shop from the main South Extension shopping Market to the interiors. This was due to the new ceiling laws by the Delhi Municipal Authorities. Their clientele includes designers and boutique shops. They participate in a lot of exhibitions. Prapun stocks handloom sarees that are manufactured in Bhagalpur. The owners have their own manufacturing units in Bhagalpur. Tussar silk weaving is an important livelihood in Bhagalpur. It is more than a century old. Several weavers in the town are employed by this industry. In addition to Tussar sarees, they stock Muga silk sarees, Matka silk sarees, Endi sarees and Gitcha silk sarees in the shop. Each is a variant of the silk yarns that are produced in Bihar, West Bengal & Assam. The silk sarees have a rough texture as compared to South silk sarees. Some sarees are very light while some sarees are heavy. They are in plain colours with a contrasting colour borders. Most noteworthy is the fact that Tussar silk threads that are in light brown colour and are called natural Tussar. They are hence dyed into a variety of colours to bring out the colourful saree. The sarees are very elegant & sophisticated. They would cost Rs. 7000 to Rs. 8000/ piece. Natural Tussar silk with woven choodi borders are a speciality in this shop. In addition, Prpaun stocks a lot of running fabrics. They are predominantly handloom fabrics. Silk and cotton fabrics that are manufactured by them, are both available in the store. There are plain silk fabrics and cotton handloom fabrics with Bagaru prints, Madhubani prints, Kalamkari prints and natural block prints. In addition, there is Endi silk fabric, Assam block printed fabric, tie & dye hand dyed fabrics. Designers mostly visit the store to source authentic handloom fabrics. Finally, Prapun has recently commenced their retail operations. The next generation of the founders have started a retail line such as kurtis and short dresses in handloom fabrics. They are called the Anshu & Navneet collection. 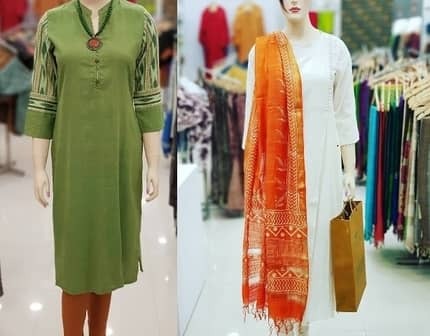 The kurtis are certainly stylish and contemporary. Even more amazing is the fact that simple elegant designs in handloom printed fabrics are distinct. While some kurtis are in simple deisgns, we found a few pieces with glitzy collars and necklines. They could be similar to an ideal evening wear outfit. Further, Prapun stocks a a great variety of stoles and scarves. They stock a few plain coloured silk stoles, silk scarves in natural fabrics and some printed stoles as well. The colours are bright & cheerful. Our Take – If you love elegant Tussar sarees and stylish kurtis visit Prapun. Prices are reasonable. Look out for Khadi Embroidered dresses.